"The bestselling author of The End of Nature issues an impassioned call to arms for an economy that creates community and ennobles our lives. In this powerful and provocative manifesto, Bill McKibben offers the biggest challenge in a generation to the prevailing view of our economy. For the first time in human history, he observes, "more" is no longer synonymous with "better"--indeed, for many of us, they have become almost opposites. McKibben puts forward a new way to think about the things we buy, the food we eat, the energy we use, and the money that pays for it all. Our purchases, he says, need not be at odds with the things we truly value. McKibben's animating idea is that we need to move beyond "growth" as the paramount economic ideal and pursue prosperity in a more local direction, with cities, suburbs, and regions producing more of their own food, generating more of their own energy, and even creating more of their own culture and entertainment. He shows this concept blossoming around the world with striking results, from the burgeoning economies of India and China to the more mature societies of Europe and New England. For those who worry about environmental threats, he offers a route out of the worst of those problems; for those who wonder if there isn't something more to life than buying, he provides the insight to think about one's life as an individual and as a member of a larger community. McKibben offers a realistic, if challenging, scenario for a hopeful future. As he so eloquently shows, the more we nurture the essential humanity of our economy, the more we will recapture our own." Ok, How did Communities get their wealth? I read Deep Economy with an open mind, however, I found it to be riddled with particular political emphasis rather than real data about economics. In short, the ideas advanced are communal farming, environmentalism through global warming mandates, and outright communism. These are not tools for the advancement of society, as McKibben suggests, but a return to the comfort of the Dark Ages. I was very disappointed in the content of the book, being lectured for the first 36 pages on the same uncredited drivel that Al Gore had preached about in his tour on global warming, the very irony of which, wherever Al Gore went, it snowed. In later chapters, McKibben actually comes out as a liberal by advocating what he believes is the solution for all the societal 'chaos' going on - state socialism. Truly this book would have been better written if it had been left blank. Deep Economy = Right on the money! 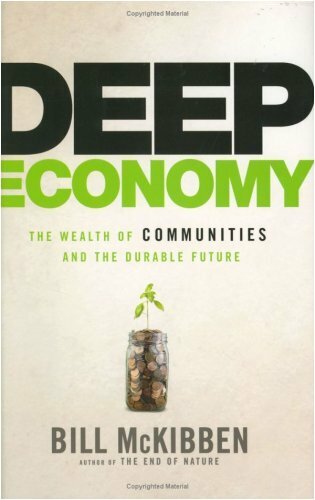 If you are looking for a good entry-level book addressing some of the more complex social issues of our time, then Deep Economy is a good place to start. Like other social issues book that deal with social issues, Bill McKibben's book will probably scare and then anger the reader at first, but it's a message that can't be ignored. McKibben's premise is that our current economy is based upon year after year growth and expansion and our environment and well-being can't take it too much longer. He argues that our unofficial national motto of "more is better" is killing us as we tear through our global resources and destroy our bodies. Technology, vocational efficiency and economic growth are turning us into the hyper-individualized individual that is easily manipulated and controlled by big business corporations. We are obsessed with consumerism and excess but studies are showing us that "more stuff" does not actually make us any happier thus it is pointless. Meanwhile we are destroying the Earth through the burning of fossil fuel and the little gains we are slowly making will be more then wiped out by the growth of China and India's economies which are trying to become like the USA. His solution is logical as he argues we must become more communal in every facet of our life. Our economies, our energy usage/distribution and our food system will all benefit the Earth as a whole if we can address these problems at the community level. This is all pretty heady stuff that most of think about at some levels, but might not be ready to accept as a way of life like McKibben suggests. Nonetheless this is a great intro book while others out there go into these subjects with more detail. Bottom Line: Because of its short length and uncomplicated prose, this is a great book to give to that special someone that hasn't read any social issue books yet but might benefit from it. Deep Economy is a very well written and important book. What I like best about it is the way Bill McKibben puts together a comprehensive way of looking at contemporary problems. He smoothly shows how individual consumer decisions, such as buying locally, and large scale environmental issues such as global warming are closely connected. I haven't read any of McKibben's earlier books, but he has been studying and writing about environmental and economic issues for several decades. The title is a play on the term "deep ecology," used by radical environmentalists. McKibben makes a persuasive case that economics is the best way to attack many of our most serious problems. McKibben's most fundamental point is that we must question the widely held assumption that growth is necessarily a good thing for the economy. He concedes that for people living in extreme poverty, a certain amount of growth is indeed necessary, but that beyond a certain point it is counterproductive. Not only for the environment, but for happiness and well being. He quotes statistics that suggest accelerated growth in income and spending has been associated with a decline in overall happiness for Americans.This is partly due to what he calls "hyper-individualism," the extreme focusing on self that leads to alienation and the collapse of communities. This is not, of course, an objective look at these issues, nor is there any pretense of this. I don't necessarily agree with all of McKibben's political assumptions. One could, for example, take many of the facts and possible solutions McKibben puts forth and interpret them in a more libertarian (rather than the anti-individualist, communitarian bias he has) way. But political ideology is not really the point of the book. McKibben believes, as do an increasing number of environmentalists, that global warming, peak oil (the world may be running out of oil very soon) and other environmental problems will soon make our current way of life (meaning Western, especially American) impossible. This is no longer a fringe position. With nations like India and China trying to emulate the American lifestyle, the prospect of running out of resources such as coal and oil no longer seems like a distant prospect. Add to this the issue of climate change and we really are facing a serious challenge to radically change the way we live. Deep Economy is more than an alarmist tirade. It contains many hopeful ideas for the future, many of which are already being done. Probably the most basic and radical idea in the book is that local food production is actually more efficient than the mass production system that dominates the marketplace today. From local farmers markets across the U.S. to innovative solutions implemented in African, Asian and Central American countries, McKibben shows that the solution to virtually all food problems is simply for more people to grow and consume locally. The vast amounts of energy used in transporting food, the health concerns presented by genetically engineered crops and factory farmed meat all point to the extreme wastefulness of the agribusiness status quo. McKibben prefers the term "durable" to sustainable, but it means basically the same thing. In this book, he makes a very good case that the only durable future we have is one that is far smaller, less wasteful and community-based than the present American model. Perhaps some of the most significant statistics he sites are towards the end of the book, where he compares American and European consumption patterns. This is important because Western Europeans are not poor or disadvantaged -in fact they have longer life spans, superior educational systems and work shorter hours compared to Americans; all this while driving smaller, more efficient cars, living in smaller homes and consuming about half the energy as Americans. This is proof that the American notion that "more" and "bigger" is better is a fallacy, and one we can no longer afford to believe in. I believe this book should be required reading for every citizen. Bill McKibben challenges the conventional dogma that continuous growth is necessary for a healthy economy. He suggests that perpetual economic growth is no longer making most people better off. He traces the roots of the doctrine back to the advent of the steam engine. During the 19th and early 20th centuries economic growth accelerated exponentially. Improving efficiency became very nearly a religion. Reliance on individualism and the free marketplace became the new mantra. It seemed that we could have the best of all worlds -- unlimited individual freedom and a chicken in every pot. This belief took a hit during the Great Depression, but it was revived following World War II. For the period between World War II and 1960 as GNP increased, poverty decreased, reinforcing the conventional wisdom that advocated perpetual economic expansion. However since 1979, real income has declined steadily for 90% of Americans. The gap between rich and poor has become ever wider. As productivity increased, individual earnings decreased. Proposed remedies range from ever more reliance on market forces and less on government (privatization), to more governmental redistribution of wealth through social programs. But no one questions the wisdom of promoting more and faster growth as a way to increase wealth. It is not a "left" vs. "right" issue. Democrats and Republicans compete as to who can grow the economy fastest! "Growth" is always the un-trumpable hand, even as more and more "middle income" people fall into poverty and inequality keeps on growing. The problem with this race for growth is twofold -- we are running out of the resource that fuels it (oil), and we are increasingly interfering with the delicate balance of CO2 in the atmosphere, creating dire consequences for the climate. We have created a vicious cycle -- utilization of finite environmental resources has led to greater wealth which has enabled us to live in ways that are contributing to greater and greater environmental destruction. This destruction threatens to lead to catastrophic climate change. No one at the center of our economic or political lives perceives climate change to be a reason to question the doctrine of endless economic expansion. Ecological economists have figured out a way to calculate the cost of carbon emissions, and to include the "embedded energy" cost into the final value of a product. A pound of factory-farmed peas, for example, includes the cost of fertilizers, pesticides, preparation, packaging, and distribution, all of which produce carbon emissions. The result is many times the cost of the original product grown on a small farm and sold locally, say in a farmers' market. This calculation is easier for an economist to follow than a politician. McKibben says we need to help them understand! He presents evidence that suggests small farms produce more food. This seems counter-intuitive, as we think of machines freeing us to do more productive work. But close observation by attentive farmers can greatly increase the quantity and quality of produce per acre. Also mega-farms are energy inefficient. Fossil fuels replaced human and animal energy with a natural resource that came cheap and was seemingly inexhaustible. The move to mechanized, centralized agriculture supposedly created a "more efficient" and abundant food system. The irony of this system is glaring as we see food banks giving out cornflakes in Iowa! It is true that producing more is better up to the equivalent of about $10,000 per person. Then the marginal utility of increased wealth begins to fall, and all that extra "stuff" becomes a burden. McKibbon offers a new way to look at how to structure our productive lives. Centralized production vs. local cooperatives each have their advantages and disadvantages. Localized economies require more man/hours but produce better quality and benefit the environment rather than depleting it. Contrary to what one might expect, they can provide more leisure time, security and individual satisfaction. They bring people together. The book is filled with stories from throughout the world where this approach is succeeding. We do not have to choose between state socialism and market capitalism. Social conservatives and environmentalists can find common ground. The social checks and balances on which the Adam Smith paradigm relies fall away as economies are nationalized and globalized and individuals become isolated. The wealthy are cut off from their neighbors. Decisions are made based on the "bottom line" rather than the common good. This brilliant book about the oncoming wreck of the global economy fails to answer the most elemental and yet essential question: How do we change human nature from wanting More! More! More! Almost 50 years ago, the General Motors' exhibit at the World Fair was based on the idea, "Technology can point the way to a future of limitless promise." If McKibben or anyone else wants to understand the future, they need only look at today's GM, or Ford. The world is heading for a similar wreck; the survivors will be those who get out of the way. This book is an example of the problem it laments; it is a dazzling example of the benign greed that is producing disaster, it offers cheery solutions well suited for miniscule groups of the conscientious, but it's not an answer. It merely uses more paper to explain the danger of using too much paper and other materials. Let's be realistic: GM's vision of the future produced gray smog, stop-and-go rush hour traffic, road rage, OPEC prices, the rust-belt, inner-city blight, White flight, auto thefts and car bombings, plus global warming, used car sales people and SUVs. It's all a product of free decisions in a free marketplace. Now, GM is collapsing but Toyota thrives with its little cars and hybrids. It's how we got today's mess. What's the solution? More free decisions in a free marketplace? McKibben is perfect when he points out small hunter/gatherer cooperative groups were normal for 99 percent of our history; but, he fails to come to grips with the monetization of relations among people during the past 5,000 years, and especially the last 300 years. Everything is now impartially subject to decisions based on free market pricing, which means the lack of hunter/gatherer cooperation is replaced by individualized competition. Our economy is a wolf-pack that has turned on itself. He cites the creation of the Industrial Age as beginning with Thomas Newcomen's invention of a practical steam engine in 1712; but he ignores the agonizing social upheaval people endured in fleeing old local sustainable farms and moving into cities. Any major change in our future will likely involve a similar human and material price. Someone needs to explain the "cost" of change and how it can come about. One solution I'm involved with on a daily basis is Amazon.com -- which by making it easy to "recycle" used and donated library books has spared whole forests. Until such recycling occurs for much more than books, we must be content with dire forecasts about the oncoming wreck of the economy. For most societies, the solution has always been collapse before radical change. McKibben offers little hope that America is different. Doable? Other reviewers are optimistic. But, I look at the sorrow of ruins and fear people are too attached to past and present mistakes to see or accept alternatives. Perhaps McKibben is right; he is certainly an antidote to my pessimism. His analysis is interesting -- if doable; and if doabvle, it is vital. In his recent book, Everything Must Change: Jesus, Global Crises, and a Revolution of Hope (Hardcover), Brian McLaren lists four deep dysfunctions that are driving us towards critical global crises. The first is environmental breakdown caused by our unsustainable global economy, an economy that fails to respect environmental limits even as it succeeds in producing great wealth for about one-third of the world's population. He calls this the prosperity crisis. In Deep Economy, Bill McKibben does an outstanding job of exploring the causes and systems that power the prosperity crisis. He clearly exposes the consequences of our unsustainable hyper-individualized culture and makes a reasonable argument that we are not only precipitating a global crisis, but are also diminishing our overall happiness. On a very basic level, "Deep Economy" by Bill McKibben is about global warming. But McKibben moves beyond the message we hear from people like Al Gore--unplug your cell charger and you've done your part!--to explain how our spending affects the environment and the strength of communities. His ideas would almost seem to contradict his message--after all, spending locally and organically actually causes consumers to spend more money than if they did all our shopping through the internet or at Big Box stores. But the result--less energy spent in transporting goods, and more relationships bulit when neighbors meet face to face--is worth every penny. One of the most frightening points he makes is that if people around the world lived as we do in America--owned the same percentage of cars, that sort of thing--we'd run out of resources. Scarier still is that we promote our brand of lifestyle through our movies and music, which cross borders; if a country the size of China buys this message, we're screwed. A final point he makes is that all this spending isn't making us any happier--our satisfaction levels, as marked by surveys, have steadily decreased. "More" is not equal to "Better," he says. At the risk of upsetting people with whom I've probably got a lot in common, I must admit that this book wasn't nearly as good as I'd hoped. I was intrigued by the book's primary thesis: that increased focus on local communities can help us to correct our current, unsustainable growth model. The idea made sense to me, and I was hoping to find some strong evidence to back it up. I was also interested to see what alternative models McKibben would suggest for evaluating progress. Unfortunately, McKibben's suggestions were vague, and his evidence was anecdotal. McKibben focuses on the ideas that farming should refocus to being more local, decreasing dependence on oil, and leading to a more green world, as well as the idea that the hyper-individualization of the United States is leading to more stress and problems, and that we should return to a local, community-based society. He correctly points out that increased GDP has not led to increased happiness in America and elsewhere. He also provides hundreds of ideas and examples of how these ideas can be put into practice. McKibben provides answers to a couple of the great questions raised about globalization and development. First, why should the US, after burning all the fossil fuels and ruining the environment to obtain the standard of living they wanted, be able to tell the rest of the world that they can't do the same? The answer, the US can't, but it doesn't matter because whether the rest of the world likes it or not, the world cannot sustain all 6 billion people living the wasteful American standard. And closely related, why should the US cut emissions and make other environmentally sound policy decisions when developing countries aren't required, and won't, do the same? Since America is a role model for these other nations that desire to reach an American standard of living, if America doesn't change its ways these other countries will see no reason to either. Unfortunately, many of the ideas proposed by McKibben may not be feasible. Complaints about the mega-farms are questionable since, while many of McKibben's criticisms are correct, previous efforts at local farming on a global scale proved to be insufficient in providing for the global, not just the US, population. Also, he provides glorious examples of local radio stations that provide extraordinary variety of a local flavor, while deploring nationwide broadcasters such as Clear Channel. The problem is that radio stations are dependent upon advertisers, which is dependent upon listeners, and listeners have not supported these local stations in the past which has allowed the nationwide broadcasters to step in. It is unclear how simply creating more of these local stations will actually get people to listen to them. This is a great book group read! It is not too long, has great examples, and is a pleasurable read. Not a book just for economic eggheads, but for everyone! When I read this book I wanted to buy 100 and share them with people and discuss the ideas in the book. Since then my book group also read the book and can't stop talking about it. McKibben challenges the fundamental economic belief that having more will make us happier and is necessary for our country's economic survival. Instead he offers a different model for our economic life that is sustainable for the planet and for us as a people.